Description: Holle is an accomplished songwriter as well as an incredible singer. Blues superstar, Bobby “Blue” Bland covered one of her songs on his critically acclaimed album Come Fly With Me. In addition to singing soul, rock, jazz, country and blues, Holle also sings in French, German and Italian. 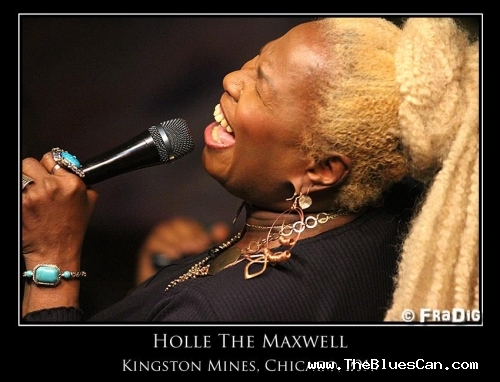 From opera, to “Thee” blues (as she likes to call it), Holle Thee Maxwell can sing it all in a way that is distinctly “Holle”. Holle recorded with jazz great Jimmy Smith, and replaced Tina Turner in the Ike Turner’s band. Holle also worked with The Temptations, Johnny Taylor, The Spinners, The Dells, Fred Williamson, Captain and Tenille, Reynaldo Rey and many others. Sammy Davis Jr., Redd Foxx, Sydney Poitier, Isaac Hayes, KoKo Taylor, Archie More, Sugar Ray Robinson, Muhammed Ali, Slappy White, Lou Gossett Jr., King Curtis and others have all been fans of Holle Thee Maxwell. Holle’s performance will not disappoint!! !